Once a Backup Set has been Activated, Amanda automatically starts the backup run at the scheduled time. Nobody needs to start the process of backups of activated sets. Progress of backup run can be seen on the Monitor . If no Backup Set > is running, the Monitor page will not display any details. However the message box will contain a message 'NO ACTIVE BACKUP RUNS FOR "...". If no details are being shown and users think a backup is in progress, then check the Change Backup Set drop down box at the top of the page to ensure that the right Backup set has been selected to display the progress. Like all other functional pages of ZMC, the Monitor page has its main functionality in the center, while other common-to-most-pages functionalities are grouped at the top of the page. 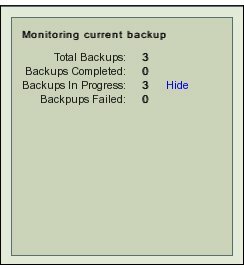 The main functionality of the Monitor page is to allow users to graphically view the progress of running of a backup of a Backup Set. Select from the Change Backup Set drop down box (labeled No4 above) the Backup Set whose progress is to be seen. 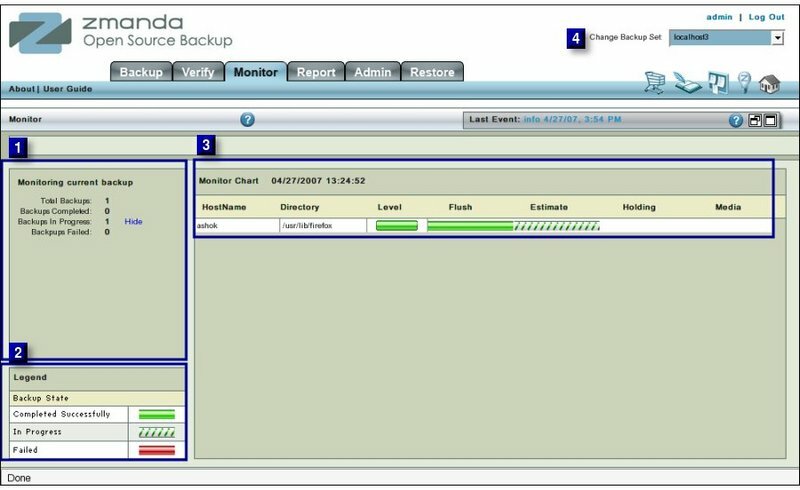 The data of the Backup Set is automatically displayed without any further user interaction. A summary of the Backup Status is displayed in Left Hand panel(labeled No.2 above). The Total Number of Disk List Entries(DLEs) that are scheduled to be backed up. Number of DLEs whose backups has been completed. The number of backups that are in progress. The Hide/ Show hyper link allows users to switch off/on the Time Line Monitor display in the Right Hand panel. The Timeline / Monitor Chart in Right hand panel ( labeled No 3 ) displays the progress of the backups that have already been done as well as those that have been started. Each Disk List Entry is displayed as a separate row. The client Host name as entered in the Disk List. The starting Directory from which the backup begins. 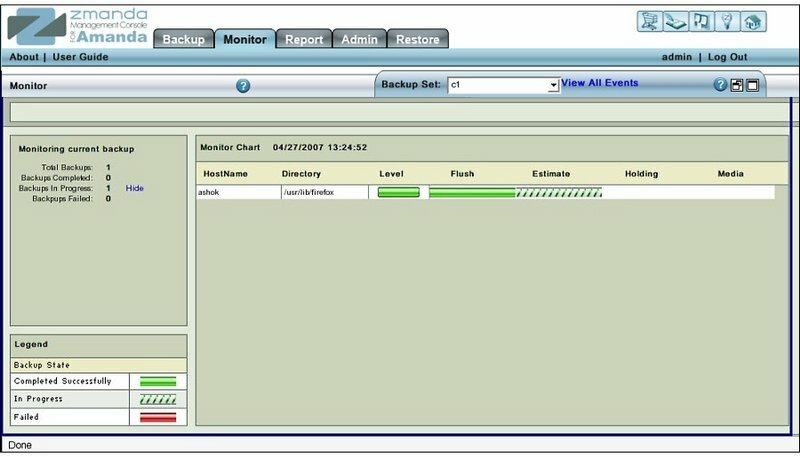 ZMC schedules its own backup levels and automatically selects them. Level 0, Full Backup, is indicated by a solid green bar as in second row above. Level 1 and above, incremental backup, is indicated by a partial green bar as in rows one and three above. Flushing transfers the data from the Holding Disk to the tape. ZMC first checks that the data of last backup run has been flushed to tape or not. If that has been done, a solid green bar will appear under this section. If flushing is in progress, a partial green bar will appear under this section. In Fig. 5 all DLEs have been successfully flushed. ZMC requests each client to furnish an estimate of the size of backup. This process takes some time. While it is in progress, partial green bars will appear in the rows. When it is over a solid green bar will appear there. In Fig. 5 the estimate process has been completed for the second DLE. When Backup image is to be written to a Holding Disk, the Timeline will show partial or solid green bars depending upon the status. Whether the Data has been written to the Backup Media with success or not. If the activity has not yet been started, the position is blank. While it is being written, there is a flashing partial green bar. If it has been written, there will be a solid green bar against the DLE. The page does not automatically refresh itself . From time to time users should refresh the page from the browser window to see the latest contents.